Most of us assume that more time studying for the USMLE Step 1, Step 2 CK, or Step 3 exams would lead to higher NBME scores. But what if they could be rising even faster? 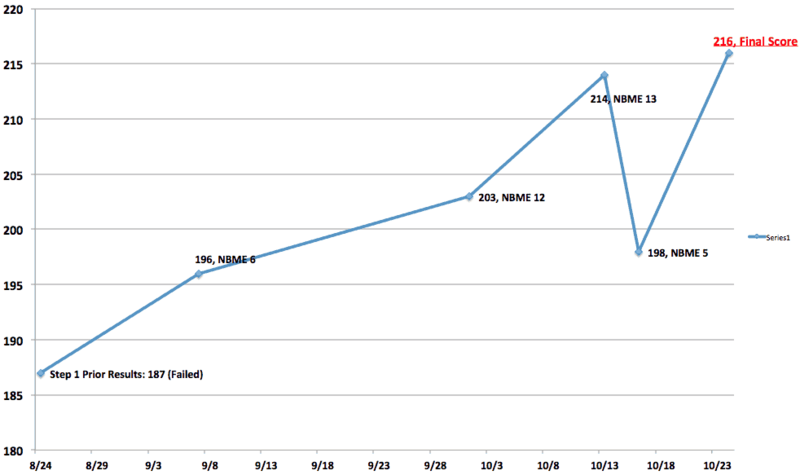 And what if your NBME scores are plateauing…or are even lower? I stumbled upon your website somehow after doing relatively poorly on an NBME today. My goal is 250+, and my last NBME (taken about 1.5-2 weeks ago), I scored a decent 234. However, today’s score was 224, and my test is in 5 days. It’s pretty disheartening knowing that I regressed in performance over a period of a couple weeks, but also alerts me to the fact that I’m not studying smart. I plan on delaying my exam after reading about your strategy, but my question is how much time do you think is ample enough to raise my score say about 20-30 points? I downloaded Anki and it looks like an amazing tool I would love to use, although I’m just a tad bit concerned about how long it will take to not only generate cards, but review them as well. FYI I’ve already done usmleworld questions one time through, and read first aid numerous times. I know your plate is probably full as it is, but do you have any suggestions/studyplans/schedule for a 3-4 week period for a guy who has already put in a few months of work? Just thought I would shoot for the stars with this email, because I’m really tired of studying hard and not getting results. I can’t begin to thank you enough for all the time and effort you’ve taken to help other people through your hard work, and you should know that its people like you who EMPOWER other people. Anyways, hopefully this reaches you at a time of minimal stress, and hopefully we can chat soon. 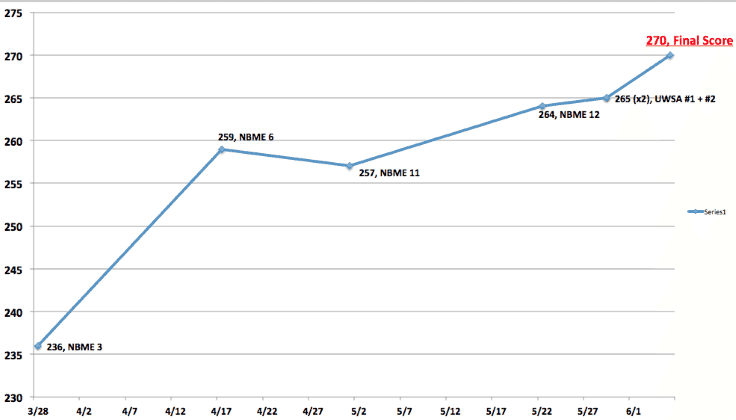 How long will it take to increase my NBME scores by (20-40+) points? Is it possible to start Anki/the Yousmle Method at any time, even if I am well into my USMLE studying? 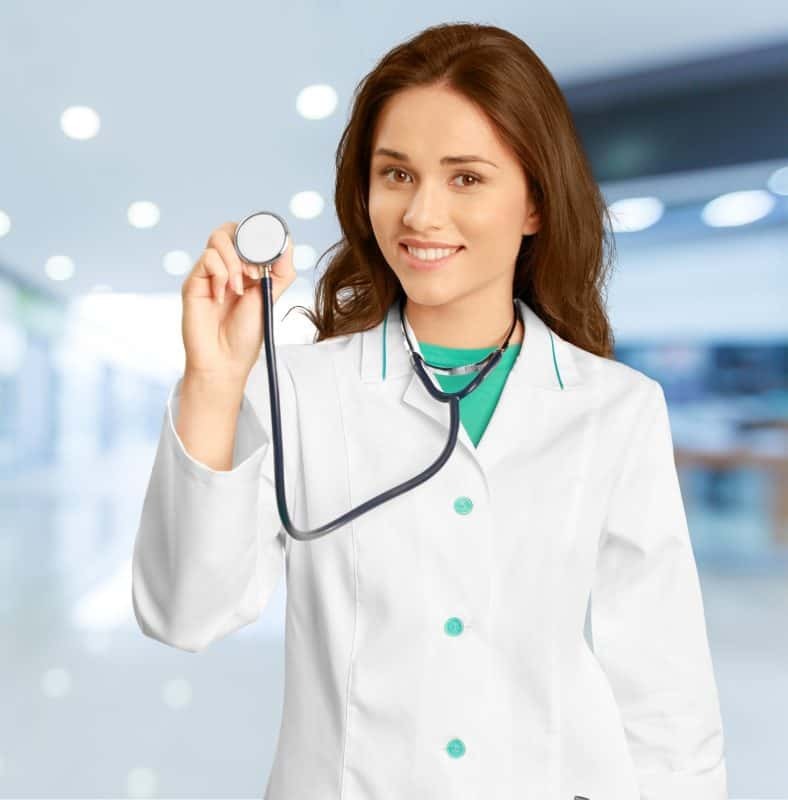 Don’t worry, to help you plan your test-taking strategy, I will share 4 USMLE Step 1 experiences (including my own) of students who have used the methods I describe on this site. And as a free offer, I’ve outlined the strategy I and every student I tutor use to raise their NBME scores. How long do I study for to raise my NBME/USMLE scores by 20-40 points? 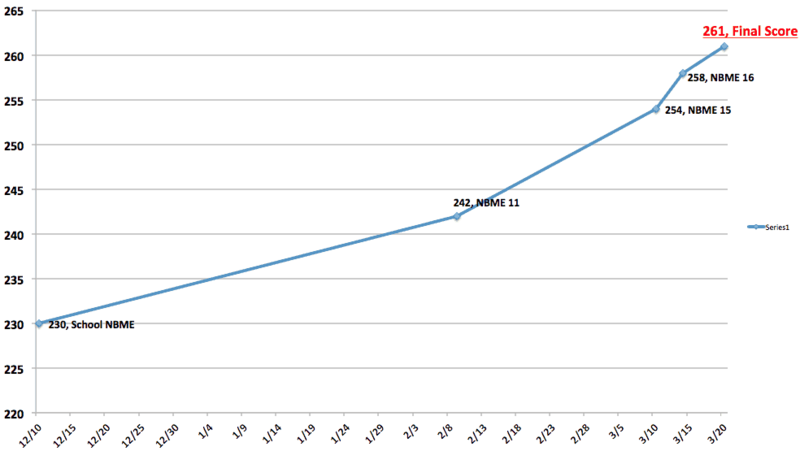 The largest jump I took was within the first 3 weeks, from 236 to 259 (23 points). I suspect that several things played a role in this. First of all, while I had been using the Kaplan QBank sporadically during my second year, I had only finished roughly 25% of the question bank (around 500 questions) by the time I took my first NBME. When I began my studies in earnest, however, I was doing between 1-2 blocks of questions per day for the first 4 weeks, then 125 questions/day thereafter. Thus, after the first several weeks, I was much more familiar with the test format, and so part of my score increase can likely be attributed to familiarity. Secondly, I intentionally started out by doing fewer questions, to give myself more time each day to study topics I was particularly weak on. For example, for the first week, I did one 46-question block a day, but studied many of my weakest subjects, including embryology. 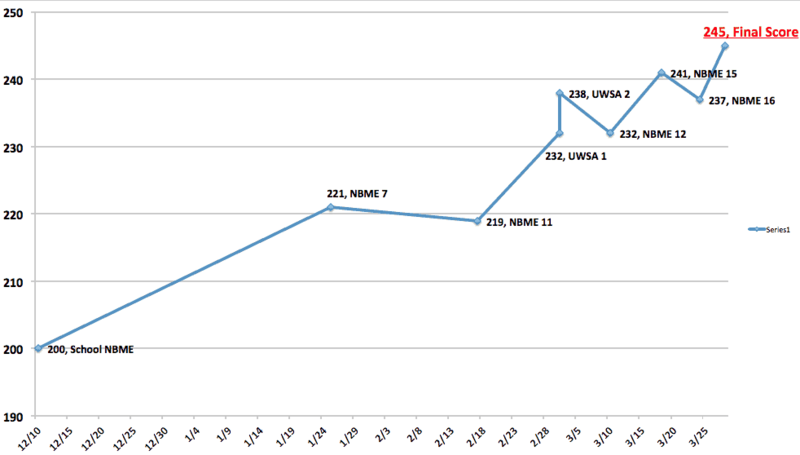 However, you’ll notice that my NBME scores, including the UWSAs, appear to trend upward until the day of my test. What about the results of students who switched to Anki/Yousmle Method for their Step 1 studies? One question I had when I started USMLE tutoring was, “could medical students adapt these methods if they had used different methods prior to their Step 1 studies?” It’s one thing to use Anki to make pathogenesis to presentation cards throughout your first year or two of medical school, but how well can these methods be adapted to someone who’s used a completely different method? Can they find similar success, and how long would it take? The good news: the fact that I’ve been a USMLE Step 1 tutor for the past several years means we have a wealth of data from which to draw. 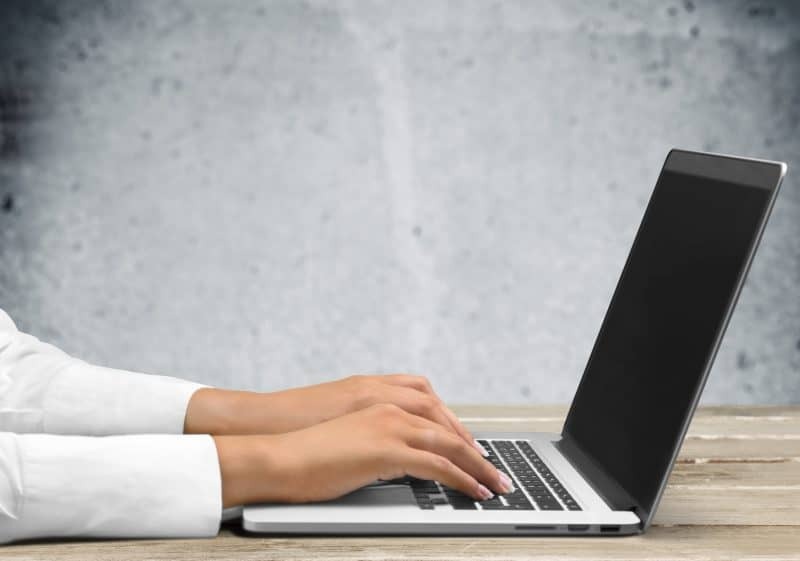 The short answer: students can adapt the Yousmle method effectively, regardless of whether they’ve been using Anki or not prior to studying for Step 1. Let’s look at some examples from three of my most recent students who have taken Step 1. Student #1: How long to go from 230 to 261? Unlike me, his NBME score increases actually appear to accelerate at the end of his studies. I want to address this in a future article, but having worked with students and seen how they read QBank and NBME questions, I’m convinced there are often as many mistakes in interpretation as there are in actual knowledge/retention. In other words, simply learning the facts is insufficient, and you can raise your score significantly, even in 2-3 weeks, simply by interpreting the question stem better. Again, it’s hard to assess his baseline, as his NBME was a month before he began studying, but even if you take the NBME he took a month after he began studying as his true baseline, he was able to raise his score 19 points in 5.5 weeks, and 31 points in 2.5 months. Student #2: How long to go from 200 to 245? This student came to me with a goal of breaking 230, from a baseline of 200. She began studying on January 6, and worked with me for about 2.5 months, over which she raised her score 45 points. Over the final 2 months, she raised her score 25 points. It is interesting to note that for this student and for myself, the UWSA exams were in fact an underestimate of our final scores. A sample size of n=2 is obviously too small to make any judgements, and I have seen the UWSA both underestimate and overestimate scores, but in general, I wonder if the supposed overestimation of the USMLE World Self-Assessments is a bit overblown. For those of you keeping score at home, is her 45 point improvement more impressive than the 31 point improvement seen in the previous example? Depends on how you look at it. Certainly, anyone would be thrilled to have such a large jump, but most people would agree that it is harder to go from 230 to 260 than 200 to 230. Regardless, both students did fantastic, and I am so proud of what they were able to accomplish! Student #3: What if I’ve failed my USMLE Step 1? Will these methods work for me? Two reflections on this student’s data. Fatigue is real: this student had taken NBME 5 after a very long day of studying, and it shows in the score (198, from 214 previously). Thankfully it was just a blip, and they recovered for the exam. This was strong validation that anyone can adapt to the Yousmle Method and continue to improve their scores. No matter if you are starting your first year/summer of medical school, at the beginning of your USMLE preparations, or if you’ve failed your exam and need to bring your score up, I have seen this method work time and time again for students aiming simply to pass to students aiming for 260+. Having tutored dozens of students in their USMLE preparations, one thing is clear: it is never too late to stop the cycle of mindless memorization and passive learning. While obviously the results varied in these 4 cases (and your results will vary), a 20-30 point increase is substantial, and will likely take at least 3-4 weeks. Again, it is a personal decision whether and how much to delay one’s exam. If it were me, if I had the time, I would probably spend even longer to make sure that I was scoring above my target score (probably in the 4-6 week range). 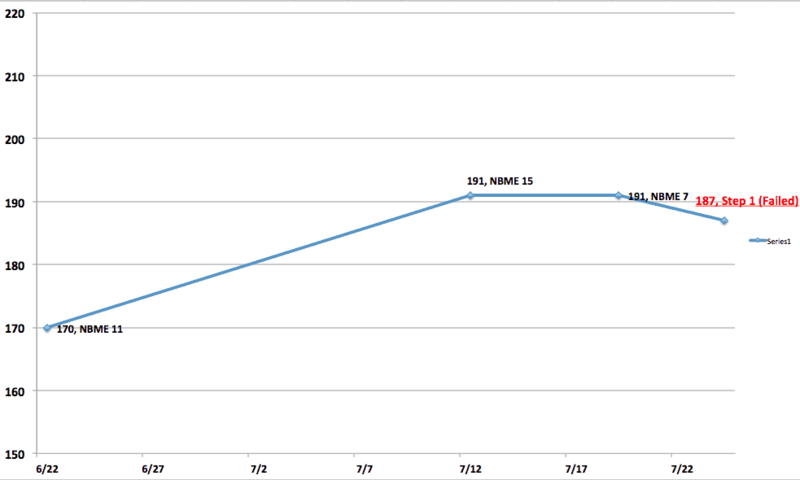 And if I wanted to target a higher increase, I would likely give myself even more time (6-8 weeks, at least). You might find yourself improving at a much faster rate (I have a student now whose NBMEs have improved by over 70 points in ~2 months), but those are very atypical cases. As such, I wouldn’t plan on having such success, and would give myself as much time to accomplish my goals as I could. Student #3 was a clear illustration that these methods could be adapted even after someone had reached an apparent plateau and has even failed their exam. So many medical students follow this pattern: they never find an effective learning strategy, and so rely on memorization. Even after two years of following this dead-end strategy, I’ve seen numerous students improve their scores substantially by following the continuous cycle of 1) learning for understanding, 2) making sure to never forget the information, and 3) learning how to apply it to USMLE questions. Looking at the trends of these students, as well as other students I’ve worked with, it is clear that few if any really reach a score “plateau” as is so often described by other students. Why might that be? Most students describe hitting a “plateau” in their score when they feel that the amount of knowledge they gain every day is balanced by the amount of knowledge they forget. The beauty of using Anki effectively is that you can constantly add to your knowledge while making sure you don’t forget anything old. This sounds great in theory, but as we can see in these 4 examples, none of us really reaches a “plateau,” in the sense that many students describe. We CAN see this illustrated by Student #3 using more traditional methods prior to working with me. She reaches a plateau, and actually have a slightly lower Step 1 than predicted. These methods are powerful, and I want to make sure you can implement them effectively, in the least amount of time necessary. What Question Bank settings do you recommend for USMLE World, Kaplan, etc.? Many of you have asked me whether I studied subject-specific, and timed/tutor/untimed. I always did random, because I felt that doing subject-specific made it too easy to eliminate certain wrong answers (e.g. if I’m studying renal, I know that all of the cardio-specific answers will most likely be wrong), and wasn’t as representative of how the real test would be. For the first month, I studied using tutor mode, to give myself time to improve my ability to read/interpret questions, but then spent the last month doing random, timed. I felt that this was a good approach, and it is one that I recommend to students I work with. However, for some students, particularly those who are scoring well below the passing threshold (e.g. 180 or below), I have used a subject-specific approach for about 4-6 weeks first. Why? 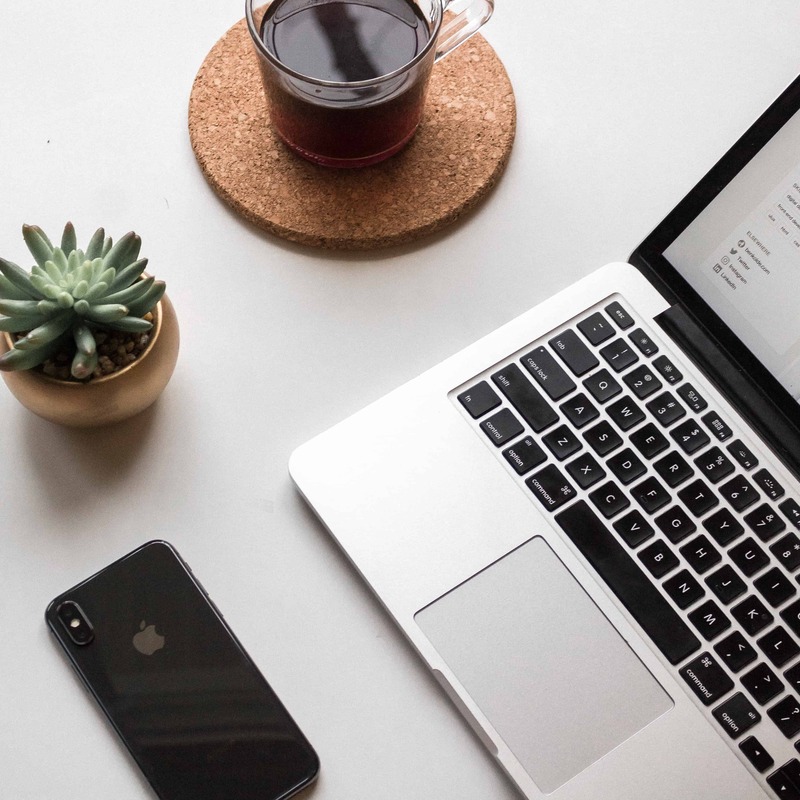 Step 1 studying is overwhelming to everyone, given the huge amount of information, if students have not learned the preclinical material as well as they’d hoped, then it can feel particularly hopeless. We can convince ourselves of this by learning one organ block at a time in such a way that we never have to go back and review that organ block. For example, we would start with our weakest topic (e.g. cardiology), learn that well for 3-5 days using the strategy outlined above, make sure we never forget it, and then move on to another topic (e.g. renal). If you do it correct, you should see a bump in your QBank percentages for that block. Because you’ve made effective Anki cards, you should be able to keep those gains, and even build on them, after you’ve moved on to the next block. In this way, we can move through the entire body, make sure we learn it well and make effective Anki cards so we never have to go back for intensive review of that topic. If you feel comfortable with the basics, read about more advanced techniques for making Anki cards here, here, and here. Still have questions? Check out my Anki FAQ. 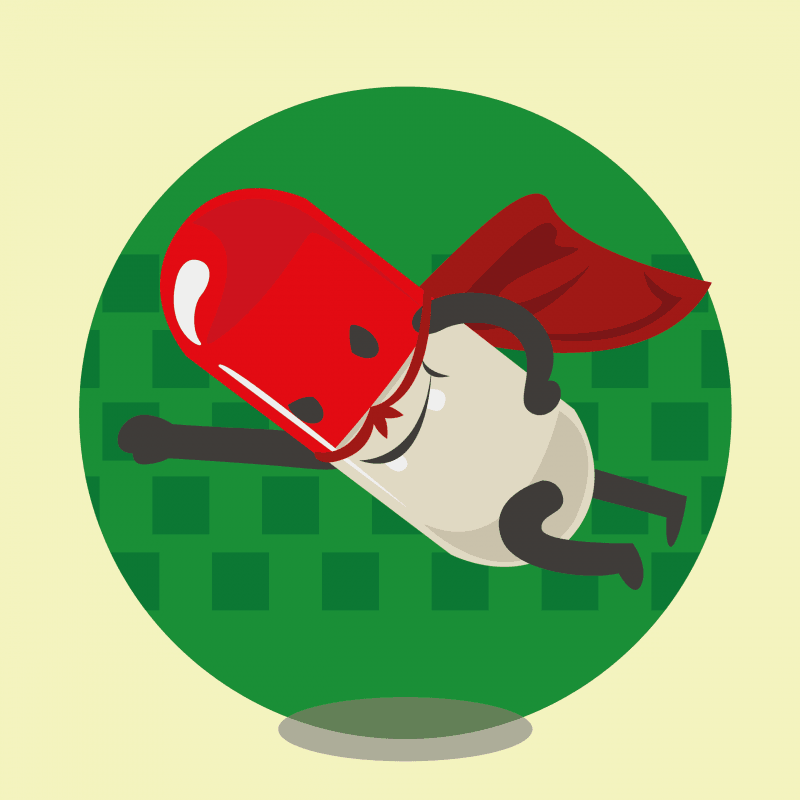 Want to read about the right and wrong approaches to using First Aid? Read this article here. When I first heard of spaced repetition, it sounded too good to be true. After many hours studying, mistakes made, dozens of students tutored, and a Step 1 score of 270, I am convinced that ANYONE can reap steady gains in their USMLE scores. Are these results really too good to be true? Do they seem attainable? Does this seem like a reasonable approach? What have you struggled with, and what, if anything, has helped you to break through when your NBME scores aren’t rising?